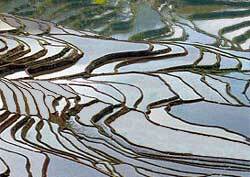 Not only are the Yuan Yang rice terraces among the world's largest and most spectacular rice terraces, they are the least known among them, which keeps the tourist count low. You get an extra sense of adventure when you are there. Although few general tourists have visited the Yuan Yang rice terraces, many photographers have because of the thrilling beauty of the landscape. The landscape changes vividly through the year. The paddies are flooded. This creates the reflecting pool effect, a photographer's dream (see photo). The paddies are luxuriantly green with growing rice stalks. The paddies become naked bare earth. The steep rice terrace paths can be quite slippery. Wear appropriate shoes or boots.